SIP is an acronym for Systematic Investment Plan. Metaphorically, SIP is just like a sip we take from a glass of water. Small intakes over a period help us in completing the drink comfortably. Investments through SIPs are somewhat similar. In SIP, you invest a particular small amount periodically to save money and achieve your financial goals comfortably. Both Resident Indian as well as Non- Resident Indian (NRI) investors adopt the SIP route for planning and executing their investments, especially while investing in Mutual Funds. Compared to Resident and ordinarily resident citizens of India, Non-Resident Indians are increasingly making use of SIP as a route for making periodic investments in Mutual Funds, primarily because of their good exposure abroad on the subject. This article will help you get an insight into SIP Investments in Mutual Funds for NRIs. Why Mutual Fund SIPs for NRIs? Before 20 years, NRI Investors showed more preference in Real Estate to get higher returns. Then, it became a high-risk market. Real Estate Market was not regulated well to protect consumers then, compared to Equity or Mutual Fund Market. The case is still the same even now. So, for the past 20 years, NRIs have been investing in Equities and Mutual Funds in India. Spending power for NRIs has increased now than earlier. So, SIP seems to be effective in terms of creating a saving habit and also in getting better returns. Instead of EMI which eats money, people are taking the financial advisors’ help to save more using simple SIPs as per their unique need. People, nowadays, are exploring more number of Mutual Funds through the Systematic Investment Plan (SIP) mode to save their loose money, which they otherwise spend on less important things in a short time. The virtue of making investments through SIPs is that the risk is evenly spread out. Small units of investments always help in balancing the risk by cushioning out uncharacteristic spikes and troughs. 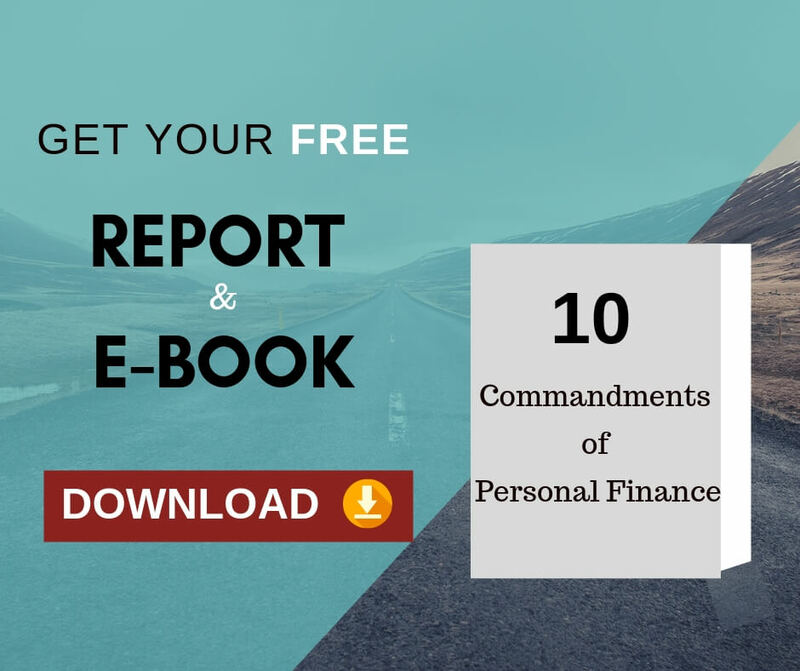 SIP is a very helpful tool in the process of building wealth, steadily, albeit a little slowly. But then, it is always the slow and steady who wins the race. 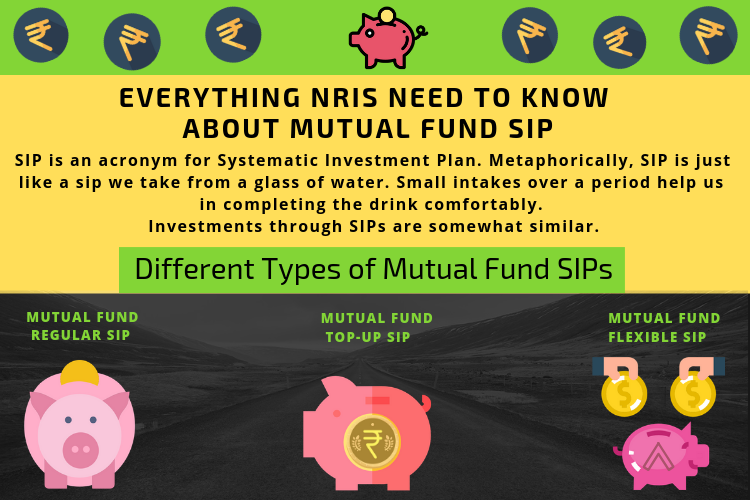 Different Types of SIPs are available for different situations. This is the most common form of SIP where the mandate is given for investment for example 3 or 5 years and a fixed amount is specified. So an investor may choose to invest for example Rs. 5000 every month for the entire duration. People with regular fixed income can opt for this type of SIP to save a regular amount every month. As the name suggests, this is a form of SIP where the regular amount can be increased in multiples of the default SIP amount for example Rs. 5000 at certain predefined intervals with a maximum limit specified. Any person can start his or her monthly SIP investment with Rs. 5000 for a period of say 3 years and instruct that the amount be increased by Rs.5000 every 6 months. When you expect no liability expenses (Loans or EMIs) or other expenses after some months, for example, after 6 months. In flexible SIP, one may increase or decrease the monthly saving in SIP based on their cash flow. They may also choose to abstain from making any contribution in a particular month or months and again increase the SIP amount in subsequent months. When the cash flow increases substantially in a particular month due to any particular event, they can contribute the entire amount to SIP. 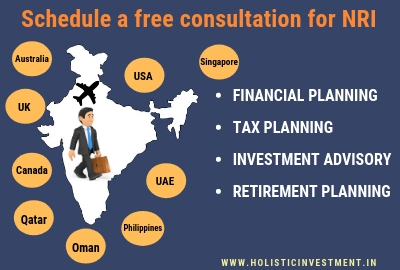 Flexible SIP is useful for NRI investors with irregular income and for people who do not want to commit a particular amount every month. NRIs in Sales Department may or not get an incentive in a month based on their output. NRI Housewives or people with part-time or freelance work may or may not get regular income in a month. Can NRIs invest in Mutual Fund SIPs in India? Yes, NRIs can invest in mutual fund SIPs in India on both repatriable and non-repatriable basis. No approval is required from RBI or any other body to invest in mutual fund SIPs in India. What are the options available for NRIs to Invest in Indian Mutual Funds through SIPs? Non Resident Indians (NRIs) and Persons of Indian Origin (PIOs) are allowed to invest in mutual fund SIP schemes in India. For investments to be made on a repatriable basis, one should mandatorily hold an NRE account or FCNR account with a banker in India. An NRO account or NRE/FCNR account is required for investments made on a non-repatriation basis. 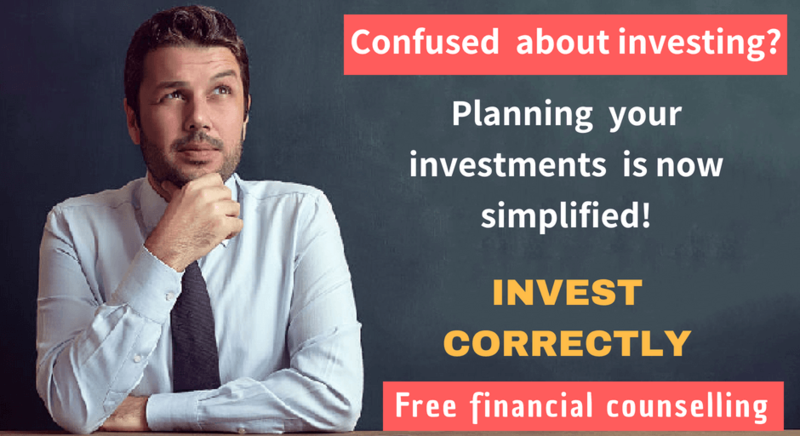 What is the procedure to be followed for Investing through SIPs in Mutual Fund? NRI investors can start to invest through SIP in Mutual Fund by proceeding in the following manner. 1. Choose from a range of Mutual Fund SIP equity and debt schemes which are on offer at a given time. 2. The periodicity of SIP needs to be decided and the same is usually monthly or quarterly. 3. Setting up or designating a NRI Bank account from where the SIP amount can be deducted electronically. A Direct Debit Mandate or Electronic Clearing Service (ECS) mandate specifying the amount can also be given. Besides, issue of post dated cheques is also allowed. Monthly or quarterly statements are mailed by the respective AMCs (Asset Management Companies) to the designated email address. NRIs proceeding with their investments in Indian mutual funds have to follow the same set of procedures which apply for resident Indians. The steps may be summarised as follows. 1. A Completed application form has to be submitted at the investor service centres along with the relevant money instrument/s. 2. Details of the Indian bank account of the investor must be furnished at the time of application. Alternatively, online application can be made. 3. Investment cannot be made in foreign currency. Rupee cheques drawn from the investor’s bank account in India or from abroad payable in a bank in India or Rupee drafts purchased abroad payable at the city where the application is made must be provided. 4. Usual facilities like nomination, appointing Power of Attorney are available for NRI investors as well. The process of redemption of Mutual Fund SIP proceeds for NRI investors is not much different from that of resident individuals. 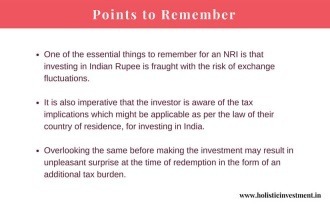 However, in case an individual’s status changes to NRI after having invested in a Mutual Fund as a resident, the maturity proceeds will not qualify for repatriation. Generally, the sale proceeds are directly credited to the holder’s account directly, or they are remitted through cheque in Indian Rupees. For investments which have been made on non-repatriable basis the proceeds will be sent directly to the NRO account of the individual. Dividend earned from the Mutual Fund SIP investments are repatriable. Well, most Mutual Fund SIPs clearly specify that withdrawals made before 1 year will attract an exit load. This means that some amount will be deducted if the investor redeems his holding before 1 year has elapsed. It is often that NRI investors feel that if they have been investing for say 3 years in Mutual Funds through the SIP route, then while redeeming the entire holding there will be no exit load. This is an incorrect premise primarily because the active SIP amounts which have been invested within the period of prior 12 months are considered as investments below 1 year and will hence attract exit load. Here is an example of exit load computation at the time of redemption, for holdings less than 1 year. The quantum of exit load is assumed as 1 % of NAV. Mr. X has been investing Rs. 2000/- every month for the last 2 years. As on 1st June 2017, he has 230 units, and as on 1st June 2018, he has 500 units. Mr X chooses to redeem 300 units on 1st June 2018. In such a case 230 of his units will not attract exit load while the balance 70 units will be charged with exit load. As per prevalent Tax Laws in India, Mutual Fund SIPs are subjected to Capital Gains Tax as they are considered as Capital Assets. The period exceeding 12 months is considered as long term and hence all MF holdings for periods exceeding 12 months come under the ambit of Long Term Capital Gains. For holding below 12 months, Short Term Capital Gain rules are applicable. Dividends are however exempt for tax. For NRI investors, TDS is mandatorily deducted for any capital gains tax which may be due. In case of resident individuals, this rule is not applicable. NRIs can take the benefit of indexation where their Mutual Fund SIP Investments are attracting Capital Gains Tax. Below are the applicable TDS rates for NRI Mutual Fund investors for FY 2018-19. India is an emerging market, and so we get higher returns compared to US which is a developed country and brings medium returns. NRI investors, who want to benefit from Indian Market, can opt for Mutual Fund Investments and choose to stay invested in the same through SIPs. Handling the dynamics of the Equity Investment might not be everyone’s cup of tea, but investing through mutual fund SIPs will generally provide good returns without having to shoulder higher risks. Mutual Fund SIP, as a channel for investing small amounts over a period, will help NRI Investors in growing wealth in a steady and disciplined manner. Previous Previous post: Questions To Ask A Certified Financial Planner Before Retirement.